Both dresses are finished... yeah. 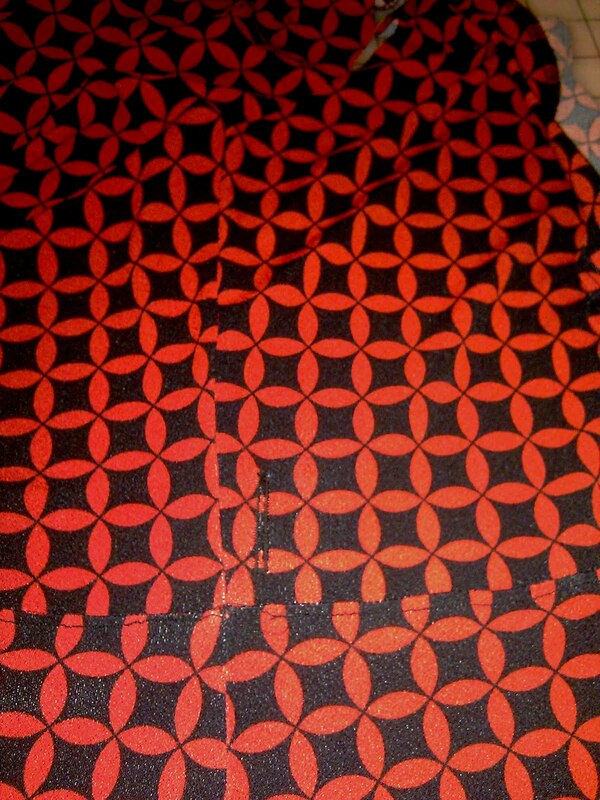 Here is a close-up of the red one (too lazy to photograph the first). 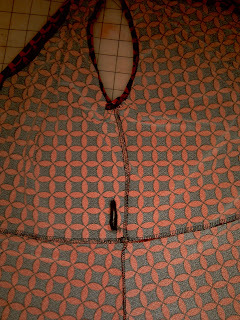 I just serged the facing/ties as opposed to sewing wrong sides together and turning to right side. 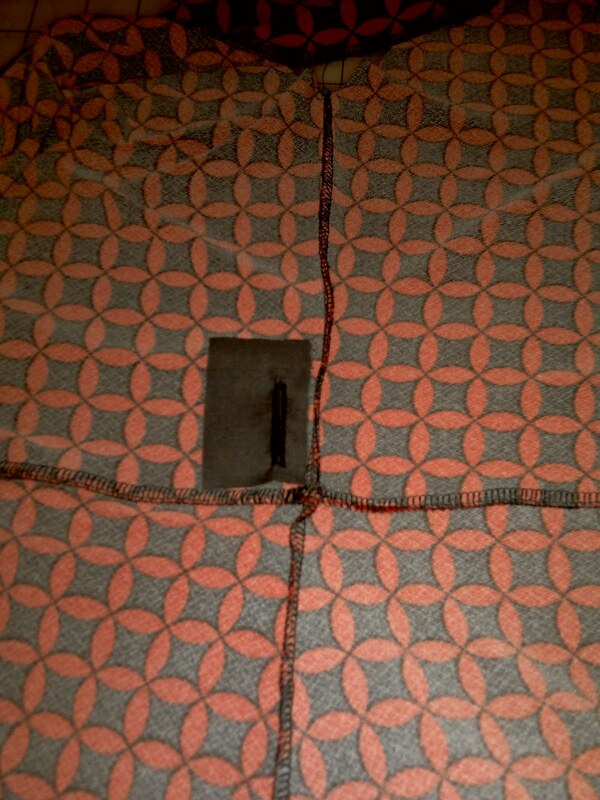 Stablized the fabric to insert a buttonhole using fusible interfacing. Fray checked & cut away excess interfacing. Thanks All for your comments on my wadder week... I took a much needed nap and was rested and up at 3:30 this morning. I decided I will leave NL6968 until next weekend and instead focus on the dresses I want to take on my vacation. 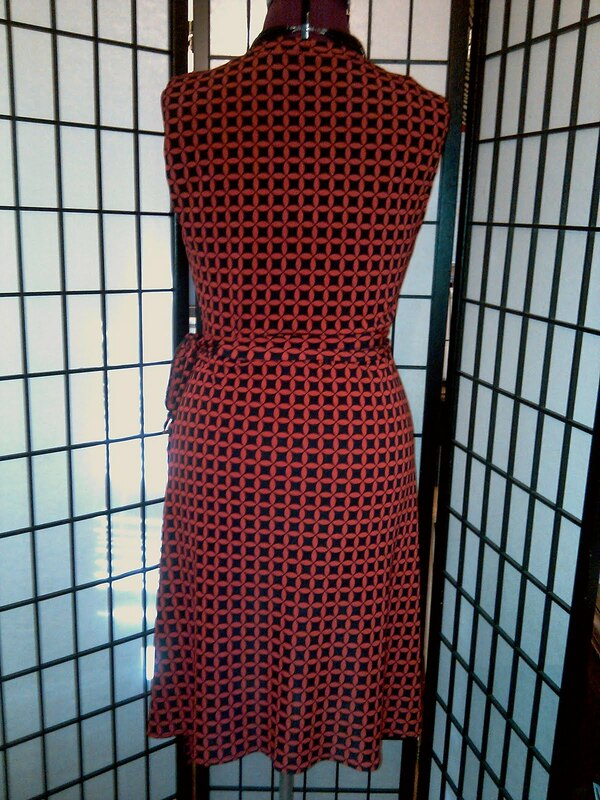 When I go on vacation I love to wear wrap dresses. 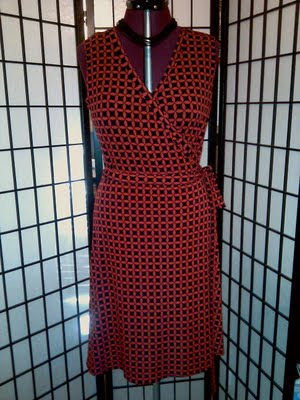 I'd purchased 2 wrap dresses over 6 years ago that had seen better days and decided to take one of them apart and made into a dress template last year. 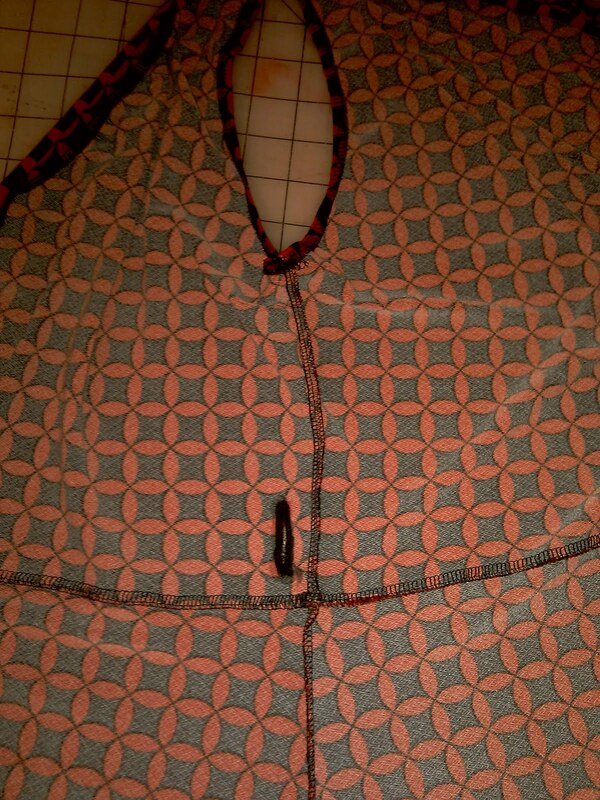 ( 7/10 & 8/10) I have made a few of them from it and the pattern is quick and easy and takes a little less than 2yds. 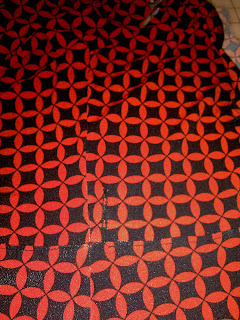 Thankfully Carolyn advised me to interface each piece and it has been a major help to keep the fabric from rolling. To assemble the dress I used New Look 6697's pattern instructions. 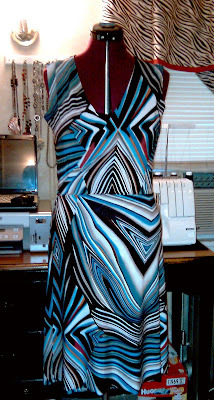 I washed & cut into my new fabric from Spandex house, the first one is a super duper wild abstract print and just what I need to get my grove back...lol..
My rtw dress template has sleeves but opted out of them. 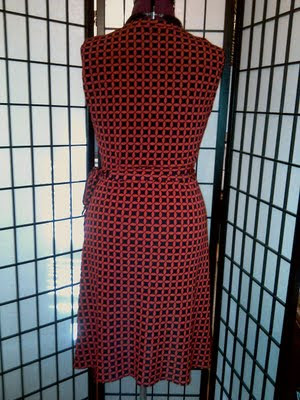 I have since added the facing, which also serves as the ties and love that about the dress. You can adjust the neckline according to how close you pull the ties around the waist. 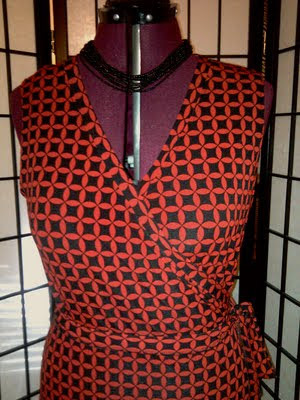 Here is the second WIP in red/black, I cut sleeves for this one, but not sure about using them yet. Hoping all had a great weekend and hope to have pics soon. That is one of my favorite movies. Taye Diggs was (and still is) a hottie! Love your new dresses and Sheila definitely has her groove back! I have to agree with Debbie, Taye Diggs was and still is a hottie! Shhhh... Don't tell the hubby lol! Glad you have your groove back Sheila! I can't wear bright prints, but I love the movement in the blue dress. I am glad you got your groove back. 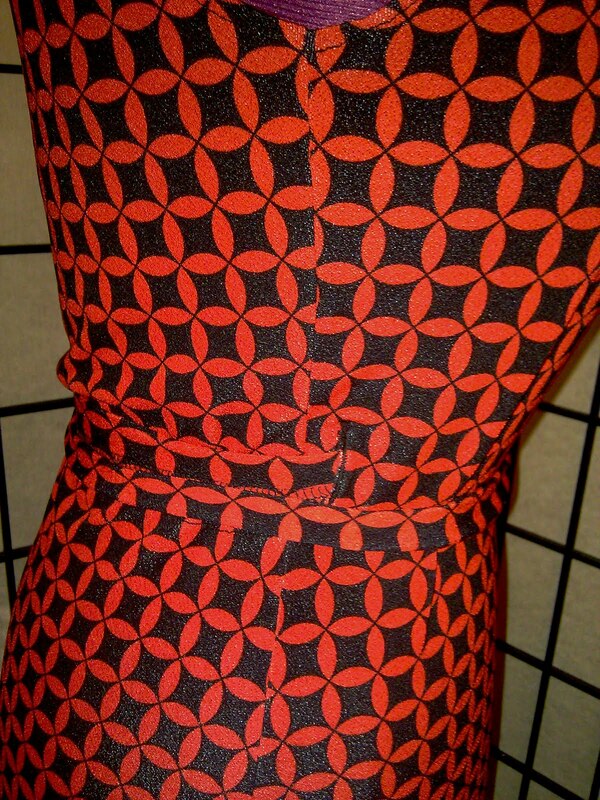 I love the print of the wrap dressess. Nice job on the red dress! Looks great! Ooh girl, Stella's got nothing on you. I love the dresses. Of course both are beautiful, about I'm drooling over the blue geometric dress. That's the way to come back, love the both dresses, I need to go fabric shopping with you. Wow on both dresses ! I really like the red one but that blue is gorgeous ! Wow! Gorgeous dresses! I love your fabric choices. Such a great eye you have for great prints! Don't disturb that groove - lol! Nice work! Both dresses are fantastic. I wish I could wear a wrap dress and look as good as you do. I think my bust to waist to thigh ratio is all off. What a bummer. You represent for me, will you? Great job! I love the blue one. Now this is a great TNT pattern! 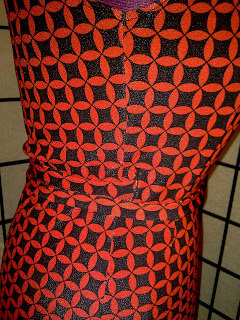 I'm glad you interfaced the pieces because now that pattern will work forever...and I love, love, love the two new dresses in the Spandex House fabrics! I love the red one! Both look very chic and comfortable. I would wear both dresses myself. The red one is the hottest.